The 19”/2 Server i7 MIL CS301 packs high-performance computing power into a frame up to 75% smaller than standard 19” rugged servers. This significantly reduces the i7 MIL's weight, energy consumption and heat production. The unit includes a 2 disk RAID (supports RAID 0,1) and a USB back-up disk. The Server is combat proven to withstand the harshest conditions over the long haul. 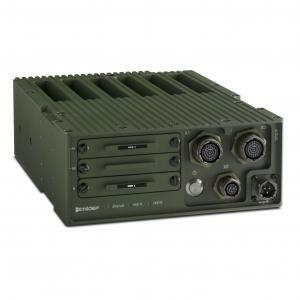 It features aluminium casing, rugged MIL connectors for easy integration and will operate down to -40 °C.